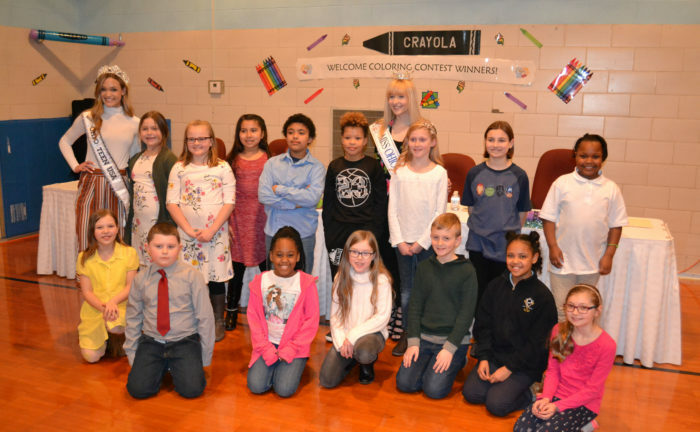 Richland County schools with third grade classes were invited to participate in the contest. Students were asked to color a picture featuring two children, one of whom uses a walker. The message on the picture simply said ‘Together We Have No Limits.’ Newhope received 504 entries from 17 schools. One winner was chosen from each school. Anne Wrobleski, an artist at Element of Art Studio/Gallery, assisted with the selection of this year’s winners. Contest winners, their parents, teacher, principal, and superintendent were invited to a pizza party on Friday, March 8, at Newhope’s Early Childhood Center. Special guests were Miss Ohio’s Outstanding Teen Juliana Heichel and Miss Ohio Teen USA Isabelle Jedra, both Lexington High School students. Also during the program, Shelby Mayor Steven Schag presented his city’s proclamation and the children had an opportunity to participate in simulated disability activities. In addition, Sarah Spayde provided musical entertainment. This year’s coloring contest winners are: Audrey Haring, Butler Elementary; Jacob Thompson, Central Elementary; Gracie Gallaway, Crestview Elementary; Lilly McFadden, Discovery School; Adam Edwards, Dowds Elementary; Emma Myers, Eastview Elementary; Shy’Nia Taylor, Foundation Academy; Izrayel Scott, Madison South Elementary; Lydia Roggio, Mansfield Christian School; Rachel Porter, Mifflin Elementary; Alau’la Collins, Prospect Elementary; Sara Holt, Sacred Heart School; Elise LeHew, Spanish Immersion School; Yvette Carrizal, Stingel Elementary; Za’Mya Thomas, St. Peter’s Elementary; Mariana Molton, Western Elementary; and Oliver Hawes, Woodland Elementary. Each of the winners received a certificate, a folder filled with disability awareness activity pages, a photograph with Miss Ohio’s Outstanding Teen and Miss Ohio Teen USA, and a gift bag that included three coloring books and crayons plus an American Sign Language “I Love You” sucker. In 2018, the Richland County Board of Developmental Disabilities (Richland Newhope) served more than 1,600 individuals through early intervention, preschool, transition services, day services, supported employment, residential, therapy, and other family support programs.